GR120 Leep Electrosurgical Unit, High frequency & effciency. 1. High frequency & efficiency..
2. 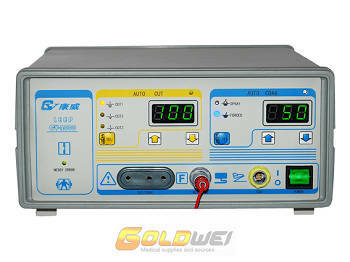 Intelligent output control guarantee surgery quality. 3. Five kinds of working model. 4. The group of memory storage function. 5. Then 1000KHZ Radio-frequency frequency. 6. Provides the high efficiency smoke absorber, protects the medical care personnel. 7. Low operation cost and low risk.